Fusarium head blight (FHB) or scab has been relatively low in most Wisconsin winter wheat fields this season. Occasionally we have run across a field with somewhat higher levels of FHB; however, compared to the 2015 crop, we suspect that the 2016 winter wheat crop should have much less FHB. With that said, it is still important to scout your maturing wheat crop and consider how much damage from FHB might be in a field as you prepare for harvest. While FHB can cause direct yield loss, the fungus that causes this disease can also produce deoxynivalenol (also known as DON or vomitoxin). Assessing wheat fields now can assist you in determining how much vomitoxin might be expected at harvest. What does scab look like? Diseased spikelets on an infected grain head die and bleach prematurely (Fig. 1). Healthy spikelets on the same head retain their normal green color. Over time, premature bleaching of spikelets may progress throughout the entire grain head. If infections occur on the stem immediately below the head, the entire head may die. As symptoms progress, developing grains are colonized causing them to shrink and wrinkle. Often, infected kernels have a rough, sunken appearance, and range in color from pink or soft gray, to light brown. As wheat dries down, visual inspection of heads for scab will become more difficult. Why is identifying scab important? Scab identification is important, not only because it reduces yield, but also because it reduces the quality and feeding value of grain. In addition, the FHB fungus may produce mycotoxins, including DON or vomitoxin, that when ingested, can adversely affect livestock and human health. The U.S. Food and Drug Administration has set maximum allowable levels of DON in feed for various animal systems, these are as follows: beef and feedlot cattle and poultry < 10ppm; Swine and all other animals < 5ppm. What should I do to prepare for wheat harvest? Figure 2. Levels of Fusarium head blight (FHB) visually observed in a fungicide efficacy trial in Wisconsin. Scout your fields now to assess risk. Wheat is beginning to mature. As maturity progresses over the next couple of weeks, it will be increasingly difficult to assess the incidence and severity of the infection. Understanding a field’s risk will help growers either field blend or avoid highly infected areas so entire loads are not rejected. DO NOT spray fungicide now. Research has demonstrated that the window of opportunity to manage FHB with fungicides is at the beginning of anthesis and only lasts about 7 days. Applications later than 7 days after the start of anthesis are not effective in controlling FHB. In addition, most fungicide labels do not allow a pre-harvest interval (PHI) suitable for a late application on wheat. Any application now would be off-label. Adjust combine settings to blow out lighter seeds and chaff. Salgado et al. 2011 indicated that adjusting a combine’s fan speed between 1,375 and 1,475 rpms and shutter opening to 90 mm (3.5 inches) resulted in the lowest discounts that would have been received at the elevator due to low test weight, % damaged kernels, and level of the mycotoxin deoxynivalenol (DON; vomitoxin) present in the harvested grain. Know your elevators inspection and dockage procedure (each elevator can have a different procedure). Figure 3. 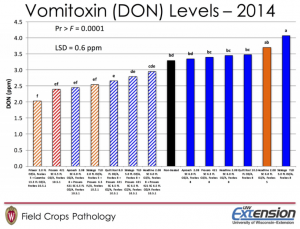 DON levels of wheat grain harvested from a fungicide efficacy trial in Wisconsin. Scabby kernels does not necessarily mean high DON levels and vice versa. 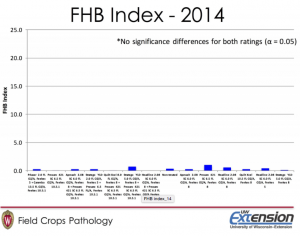 For example, in a 2014 fungicide evaluation very low visible levels of FHB were observed for all treatments (Fig. 2). However, when the finished grain was tested for DON, significant levels were identified for all treatments (Fig. 3). Be sure to test and know what levels of DON are in your grain even if you didn’t see a high level of visible disease. Also, don’t assume that because a fungicide was used, there will be no DON. DON can be present in the straw so there is concern regarding feeding or using scab infected wheat straw. DO NOT use straw for bedding or feed from fields with high levels of scab (Cowger and Arellano, 2013). If in doubt, have the straw tested for DON levels. Do not save seed from a scab-infected field. Fusarium graminearum can be transmitted via seed. Infected seeds will have decreased growth and tillering capacity as well as increased risk for winterkill. Do not store grain from fields with high levels of scab. DON and other mycotoxins can continue to increase in stored grain. 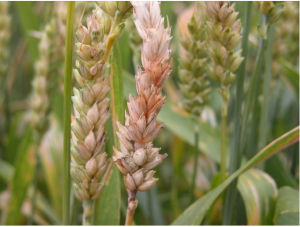 For more information on Fusarium head blight click here. Cowger, C., and Arellano, C. 2013. Fusarium graminearum infection and deoxynivalenol concentrations during development of wheat spikes. Phytopathology 103:460-471. Salgado, J. D., Wallhead, M., Madden, L. V., and Paul, P. A. 2011. Grain harvesting strategies to minimize grain quality losses due to Fusarium head blight in wheat. Plant Dis. 95:1448-1457.